Being qualified to level 4 status as a fitness professional is the highest accredited level achievable. This not only sets you apart from other fitness professionals but allows you to stand out as a specialist, and help more people that you want to work with. Level 4 is a logical progression from the Level 3 Exercise Referral Qualification, building on the knowledge you have already gained and accelerating this into a lot more depth just on Obesity, Diabetes and weight management strategies. What is the Level 4 Obesity and Diabetes Qualification? What are the 6x Level 4 Obesity & Diabetes modules? Each video module is specifically mapped to your level 4 Obesity and Diabetes manual and the leading awarding bodies: Active IQ. The Level 4 Obesity and Diabetes Qualification is £499 u̶s̶u̶a̶l̶l̶y̶ ̶£̶5̶5̶0. 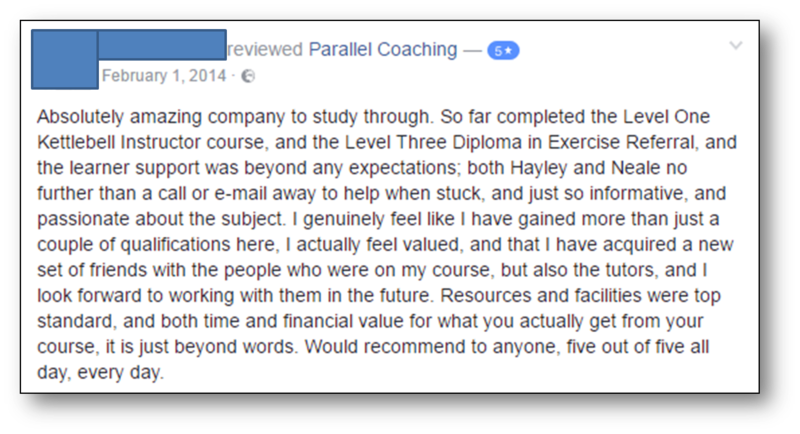 Parallel Coaching offers a payment plan; Pay a minimum of £100 deposit and pay NO INTEREST, on the balance across 2, 3 or 6 months. You will learn everything you need to become an effective Obesity and Diabetes Specialist. Each module is approximately 1 hour long; not only explaining the physiological “Ins & Outs” of weight management, but explained with analogies and client stories to spark your instructor creativity and effectiveness. You will learn everything required to pass the qualification, and a lot more beside, so you leave confident and ready to train Obese and Diabetic clients immediately, through the guidance of your experienced tutor. It is essential that you have completed your Level 3 Exercise Referral Qualification (or working towards it). 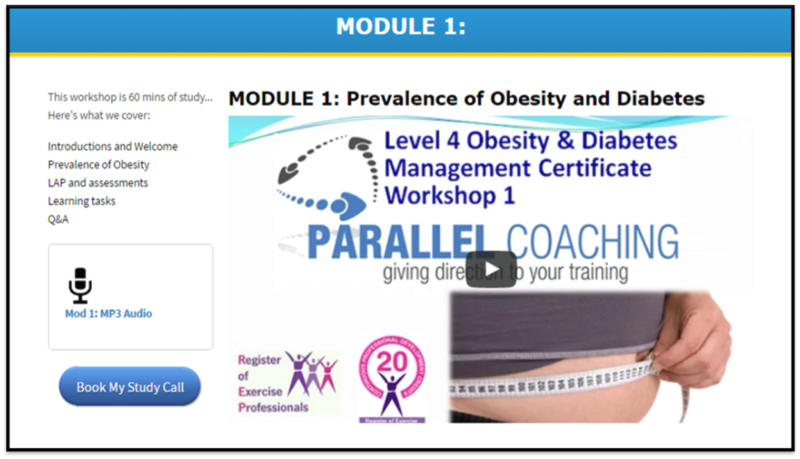 A discount is available if you wish to purchase both the l3 exercise referral and level 4 obesity and diabetes qualifications, through us at Parallel Coaching. Speak with your tutor on your enrolment call for more details. You need to be passionate about working with Obese and Diabetic clients. As a Level 4 obesity and Diabetes Specialist you can expand the work you currently offer with clients, start a new project, strengthen your specialist brand, work within an exercise referral scheme and link with health care professionals. Level 4 is the highest qualification level within the health and fitness industry at the moment. However, many students enjoy learning the level 4 syllabus so much that they then enrol onto the level 4 low back pain qualification. Maybe you have had your own weight loss and health journey, or just have a fascination with weight management, hormonal regulation and nutrition. Maybe you find yourself attracting a certain type of client, and have a lot of clients that are obese and/or diabetic.